The Church that Jesus Christ established is a Hierarchical Church, with Jesus being the Head, then the Apostles (with the bishop of Rome being first among equals), then Cardinals/Priests then Deacons and then the laity. This order of rank comes from our Lord Jesus himself. This was clearly known even as the Church was starting to take shape, for when Mary Magdalene found the Tomb empty, “She ran and went to Simon Peter and the other disciples”, notice Peter is first, and the other disciples. When Peter and the other disciple both ran to the tomb, the other disciple reaches the tomb first but waited for Peter. In the Acts of The Apostles, chapter 2, verse 14, “But peter, standing with the Eleven, lifted up his Voice and addressed them”,. Whenever the Apostles are listed or numbered in Scripture, Peter is always first. But it was when Jesus gave Peter the “Keys to the Kingdom of Heaven” that it solidifies the Church a Hierarchy. So, the Catholic Church, the one true Church established by Jesus Christ is Hierarchical, always has been. This is very important when dealing with the rubrics of the Church and most especially of the Mass. Using the Mass as an example; the main focal point is the Eucharistic Liturgy (The Holy Sacrifice of the Mass). This comes from our Lord Jesus Himself because He commanded it. It was not a suggestion or a recommendation but a commandment by God Himself. So the words and form of the Eucharistic Liturgy come from our Lord Jesus and then through the Church. (1 Corinthians 10:14-22). So, a layman, Priest or Bishop cannot change the Mass because the Mass comes from the Church, which comes from Jesus the Christ. Another example would be, the now very common, holding of hands by the congregation during the “Our Father”. Many Churches these days feel compelled to require the congregation to hold hands but this is wrong! The General Instruction of the Roman Missal (GIRM) says nothing of requiring the faithful to hold hands. If the Church does not require it, by who’s authority is the faithful being asked to obey? This is what is known as the “tail wagging the dog” and many Priests and sadly Bishops seem to think that the Mass comes from them, a wicked thing that comes from the Devil himself because it breaks the unity that our Lord prayed for. If individuals want to hold hands during the “Our Father”, there is nothing stopping them, it is only when the individuals require it of other individuals that it becomes anti-hierarchical. “I promise to assist them at the hour of death with all of the graces necessary for the salvation of their souls” Here, our Lady clearly indicates that she requires “fifteen mysteries”, not twenty but fifteen. Pope John Paul II did not require twenty mysteries he only recommended the additional, so where is the authority coming from that we must pray the Luminous Mysteries when our Lady clearly states fifteen? According to The Handbook of Indulgences A plenary indulgence is granted when the rosary is recited in a church or oratory or when it is recited in a family, a religious community, or a pious association. A partial indulgence is granted for its recitation in all other circumstances. It has become customary to call [one set of mysteries] the “rosary” also. Concerning this customary usage then, the following norms are given regards a plenary indulgence. The recitation of [one set of mysteries] is sufficient for obtaining the plenary indulgence, but these five decades must be recited without interruption. Devout meditation on the mysteries is to be added to the vocal prayer. In its public recitation the mysteries must be announced in accord with approved local custom, but in its private recitation it is sufficient for the Christian faithful simply to join meditation on the mysteries to the vocal prayer. UPDATE: The Vatican has completely changed their website and all links are broken! You can still see the original website on http://archive.org/web/ Just copy the links above and paste them into their search engine. Tagged: Fatima, Luminous Mysteries, Our Lady of Fatima, Pope John Paul, Rosary, Rosary.pdf, The Holy Rosary. One thing I find interesting about the Rosary is the Fatima prayer. Here we are presented with the traditional way to say the Rosary. Also, what grabbed me is the statement that it was difficult to find any information on how to say the Rosary before JP-II’s addition of the Luminous Mysteries. In my Family Bible (one of the big “stately Bibles” Douey Rhimes Translations published in the 1960s), there were instructions on how to say the Rosary. I noted that the Fatima Prayer is never mentioned (I never even heard of it until about five years ago). I don’t say the Luminous mysteries or the Fatima Prayer when I say the Rosary. You are correct, the Fatima Prayer is not required as per the 1962 Missal, anything before or after the three Mysteries is devotional and there by optional. Being Portuguese and a believer in the apparition the prayer makes sense to me and it did come directly from our Lady. What harm is it to pray more.? In these times we are living in, God is giving us more graces. We need more prayers for those who say no prayers, if we are going to be so precise on what is written, why have we changed the only prayer our Lord has left us with, the “Our Father”, our Lord said forgive our debts not trespasses ! The two words have two totally different meaning. 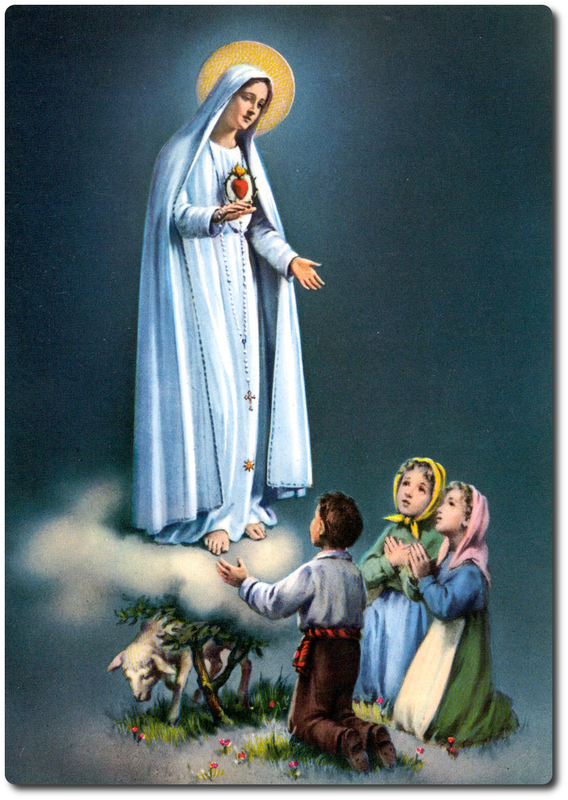 So many apparitions have happen, such as The Fatima apparitions, which i don’t think they are recorded in the Bible, What if we had ignored our Lady’s request’s. The sad thing is I am a Legion of Mary member, and I have been trying to have the Fatima Prayer included in our Rosary at our meetings, but at one time the message came back to us from our Curia “If you include the Fatima Prayer at your meetings, you will no longer be affiliated with the L.O.M., how very sad is that. I am still trying to have it included. My next step is Dublin. I’m with you, Joao, only praying what was given to us by Mary. 15. Anything added is added by man & to me, not Jesus. I’m traditional, pre Vatican II all the way…. But my question would be, why not pray the luminous mysteries? I don’t hear anyone telling me I must pray them, but why not? They’re beautiful. They allow us to meditate on other important moments in Christ’s life, most especially the Eucharist. And in the pope’s words, it’s “fitting”. I really don’t think that the Blessed Mother and JP2 are in opposition over this…. Because they wreck the 15 mysteries, break the tradition, are meaningless and finally, they were introduced by a false pope. What we “think” is not relevant. What matters is that the Blessed Mother gave St. Dominic 15 Mysteries and instructed that the faithful meditate on the 15. St. Pope John Paul II only recommended the five additional. Had the Blessed mother wanted 20 mysteries, she would have said so. We don’t live by what we “think” about what God or the Blessed Mother said or did, but what in actuality was handed down to us from them. Our Blessed Lady gave us FIFTEEN. Nothing should be added to that or taken away from it or else it is an insult to Our Blessed Lady. Hello Kim, it is a matter of obedience. The Rosary, like the Our Father, is a prayer that does not come from the Church but from Heaven. The Our Father comes from our Lord Himself and the Rosary comes from our Blessed Lady so the Church hierarchy has not authority to change what they did not give. Much like the Church has not authority to change the Gospel but only preach it. Further more, because its 150 Hail Mary’s correspond to the 150 Psalms of the Psalter adding another mystery breaks that link. I recommend you click on the link at the bottom of the post, it has more detail that I think you are looking for. You should try the version of the Fatima prayer in Latin that is promoted by the Fatima Center and Fr. Gruner, R.I.P. O mi Iesu, dimitte nobis PECATTA nostra, líbera nos ab ignibus inferni, perduc omnes animas in caelum, praesertim maxime indigentes. Amen. Hello and many thanks for this website! I have prayed the ‘Mysteries of light’ on and off since their ‘introduction’ but from now on I will pray the traditional 15 as given by our Blessed Mother. I heard a priest explaining the 5 mysteries of light are a wonderful meditation on the life of our Blessed Lord and by all means can be prayed as a chaplet but are not part of the Holy Rosary only the traditional 15 are. So basically when one feels it would be good praying and meditating on the new mysteries go ahead but are not actually part of the Rosary. Thank you for your your prayers. Anthony, I am sorry I did not see your post earlier, could not agree with you more! This morning at Mass our freshly ordained priest told us that if we are distracted during prayer, perhaps we need to pause and reflect on what is distracting us. Fair enough. Perhaps that is something which requires our special attention. If we are praying the Rosary, and it isn’t doing anything for us, we should set it down and pray something else, as the Rosary is just a tool, and we are not required to pray the Rosary daily. He doesn’t. After Mass I asked him, shouldn’t we then later pick the Rosary back up, and resume praying it? Aren’t people going to hear that they don’t need to pray the Rosary? No, says he, it is just a tool. That’s ok, the Rosary is just a tool. He did tell me he has other ‘consecrating to Mary prayers’ that he says, but he didn’t elaborate on what those were. I think, if given a choice, I’ll pick a different priest for confession. I find this unsettling. Thank you for link! I have wanted the Douay-Rheims Bible but could not afford one right now. Now, I can read it online from your link…thank you so much! Christ be with you forevermore. Joao, who are these priests celebrating the Traditional Latin Mass? Douglas – he is correct. Saying the Rosary is entirely optional. All of it. The key to spiritual advancement (St. Alphonus, Thomas Aquinas, De Sales, etc etc) is mental prayer. They go so far as to say that spiritual advancement is impossible without it. Thats quite a statement indeed! It is THE number one devotion, ahead of the Rosary. De Sales actually makes this point crystal clear in The Devout Life. Because only through mental prayer are you able to better participate in mass, meditate on the mysteries of the rosary, etc. Mental prayer leads you into ALL other types of prayer. It makes your ability to say the Rosary BETTER. As Theresa of Avila and John of the Cross write, there are 9 levels of prayer. The Rosary is about level 1.5 because it is vocal and contemplative. But this is just the beginning of the spiritual life, and spiritual theology. They make a point of instructing people that prayer life is not simply about saying a certain number of rote prayers…its a conversation with the Trinity. Mental prayer is an interview with God. Back on point – of course the Rosary is excellent and wonderful…but it is but one tool in a much larger toolbox. Of course we should say it daily if we can. Yes, Yes, Yes. Learn to say it as best you can. But the Rosary is not an end. It is simply a means to draw closer to Christ. Take a look at De Sales and St. Alphonsus – and check out mental prayer. There is an outstanding book by TAN written by Dom Lehodey that details mental prayer. Tim, Fatima is a PRIVATE revelation pertaining only to those hearing the message. We are not even required to believe in private revelations. Therefore, your statement is misguided. Personally, I love the rosary, but in no way am I required to recite it daily. Carol, Fatima was NOT a “private” revelation, because it was a public revelation confirmed by a public miracle. That argument is often used by those who wish to diminish the importance of the message. As for you pressing the Rosary, our Lady never required anyone to say it, she asks. I found tradcatknight.blogspot.com to be the best blog to go to if you are searching for the “true” teachings of the Catholic Church. Bishop LaFebvre who founded the SSPX (who are no longer following Bishop LaFebvre true teachings of the Catholic Church, but joining up with the Heretical Vatican II church, left it years ago because he could not be in union with heresy, and held to the true teachings of the Apostles given to them by Jesus. TradCatKnight, also left SSPX and now has a blog that tells us everything that is happening in the novus ordo church and giving us traditional prayers and locations of priests that are resisting Vatican II changes. In a state of necessity like we are in today and have been since Vatican II, we are not obligated to follow what is going on in the new church, to go to church where the true teachings have been watered down to nothing. We can no longer go to these and you will NOT find a real priest in the novus ordo mass anymore. It is also a mortal sin to go to one, we are endangering our souls, and causing scandal to others who are thinking that the Modernism being taught in the church is what Jesus taught. On TradCat you can also read proof of what the 3rd secret of Fatima really says from Lucia herself to priests in her life. And the Blessed Mother said we must Pray the Rosay every day for the conversion of Russia. Putin has already gone to Pope Francis and asked for the Pope to Consecrate Russia to Her immaculate heart and he said, NO. Francis is a modernist. Brothers and Sisters, I write to you in behalf of the Selfless Love and peace of the Union and Marriage of Jesus Christ and of His Sacred Heart and all the blessings that flow forth from It. In times of supposed uncertainty we have recourse to the Blessed Virgin Mary, Our Ark of Hearts. She is a powerful intercessor, who warns before the “Storm” and who the enemy fears very much. I recall reading in the Memoirs of an Anti-Apostle of how an “infiltrator Marxist” even recognized how powerful She is. This wolf, knew, without question, that when Mary is implored miracles happen. He further knew that it was Mary who could steer the Church out of the present crisis. He knew the Consecration of Russia to Her Immaculate Heart was vital to world peace hence why the enemy in the Vatican continues to ignore and tap dance around this command of heaven. Let us take a further look into Our Lady as this “One Woman Army”. She is terrible to behold (in a good way) and who will show no mercy to the enemy when the appointed time arrives. The Intercession Of Our Lady invokes the Lord. And David arose and went, with all the people that were with him of the men of Juda to fetch the ark of God, upon which the name of the Lord of hosts is invoked… 2 Kings 6:2 Through Mary to Jesus. We implore the Immaculate Heart that we might come to a deeper understanding of the Sacred Heart of Christ. David arose to fetch the Ark and so too must we “actively seek” our Queen. She is the Guide of the Fortress of the Soul. We must seek Her out so that She might show us the path to His Sacred Heart which is found in the highest floor and most inward room in this Fortress where two hearts become One. Indeed She is a guide in this union of hearts (wills). Do not delay any longer and invoke our Lady. The enemy has captured our Queen? And the ark of God was taken…1 Kings 4:11 Since Vatican II we can say the enemy “has taken” the Ark. The Modernists are the modern day Philistine’s. They have heard us singing aloud and the trumpets sounding. They have in a certain sense stolen Her from our camp. They now use the Blessed Virgin Mary in many cases to further the New Religion. From the “new” and “expanded” (luminous mysteries) Rosary of JP II to the latest false apparition sites around the world Mary is being “used”. However, these sites all lead back to erroneous doctrine. The enemy has captured Our Queen yet still so many “traditionalists” do not pray for Her return! The Blessed Virgin Mary warns. So the ark of the Lord went about the city once a day, and returning into the camp, abode there. And Josue rising before day, the priests took the ark of the Lord,  And seven of them seven trumpets, which are used in the jubilee: and they went before the ark of the Lord walking and sounding the trumpets: and the armed men went before them, and the rest of the common people followed the ark, and they blew the trumpets. And they went round about the city the second day once, and returned into the camp. So they did six days. Joshua 6:11-14 Upon meditating on this Scripture today I find it interesting that “trumpet sounds” are now being heard worldwide and why? Because precedence has been established in the Word that the trumpet sounds before the Ark then cometh the chastisement. It is a warning and although more than likely not supernatural in origin (trumpet sounds) this is still not a coincidence that God is allowing it. She goes before the chastisement to warn of the destruction coming. The Blessed Virgin Mary has been “circling the city” now for 6 days and the seventh day is soon coming wherein the trumpets will sound again (last time) and we shall shout and witness the New World Order fall. Some shall witness (after the fact) on God’s Day of Wrath, more specifically, the three days of darkness, O’ how mighty the true God is! Do you hear the trumpets O’ Islam? Communist? Marxist? Protestant? Jew? Modernist? We are circling “Jericho” like eagles letting the enemy know they and their new city of man are about to fall. Our Lady goes before us into battle. And again he said: By this you shall know that the Lord the living God is in the midst of you, and that he shall destroy before your sight the Chanaanite and the Hethite, the Hevite and the Pherezite, the Gergesite also and the Jebusite, and the Amorrhite. Behold the ark of the covenant of the Lord of all the earth shall go before you into the Jordan. Joshua 3:10-11 It is not by human efforts that we will achieve the victory. For, although, wilst we work in and with the Blessed Virgin Mary, the source of this victory is above our pay grade. She has been given the victory by God Himself in these times and thus Mary, as Co-redemptrix, will yet again show the world that when “invoked” She can aide/help save humanity. She knows the war we must fight the battles. We point to her who in return shalst point to God. All glory goes back to the true and Living God! Mary’s simplicity and humility is like no other. Will you spread your wings of Faith and Hope and follow her lead for your own lives? The Enemy Fears of Our Lady. And when the ark was lifted up, Moses said: Arise, O Lord, and let thy enemies be scattered, and let them that hate thee, flee from before thy face. Numbers 10: 35 We lift high our Blessed Queen “in veneration” and rightfully so. And when we do so the enemy scatters for he who wouldst hateth our Queen likewise hateth the King. The enemy (the devils) is not indifferent towards our Lady they are utterly distraught upon seeing Her. They tremble, they mutter and curse for Her heel is always standing on the neck of the serpent. The devil’s time is short and yet he will try to convince everyone that not only was the Fatima message not important but further he will tempt men into not believing in it at all. Why thence do you hide O’ enemy the truth of the third secret? The mighty seek a place in this world and yet it is Our Lady who helps us to break from this world. Do not fear the one who wilst lead you to the world fear succumbing to self that you might adjoin your heart to this world. Furthermore, watch the Church’s enemies soon flee in terror when the Sun dances for a second time! Thereis no bunker deep enough for them to hide in. Genesis 7:14-15 (14)And the Lord God said to the serpent: because thou has done this thing, thou art cursed among all cattle, and the beasts of the earth: upon thy breast shalt thou go, and earth shalt thou eat all the days of thy life. (15) I will put enmities between thee and the woman, and thy seed and her seed: SHE WILL CRUSH THY HEAD, AND THOU SHALT LIE IN WAIT FOR HER HEEL. RUN DON’T WALK AWAY FROM THE NOVUS ORDO MODERN CHURCH IF YOU WANT TO GET TO HEAVEN. THEY ARE ALL LIARS AFTER THE FATHER OF LIES!!! Pray the Rosary first every day and Our Lady will lead us to her Son and away from Lucifer. Do NOT read any books written today. GO TO TRADCATKNIGHT.BLOGSPOT.COM and find out the truth. THERE IS NO REAL PRIESTS IN THE NOVUS ORDO CHURCH OR BISHOP OR POPE SINCE VATICAN II. EVEN POPE PAUL II WAS A MODERNIST. You have said a lot here, and I think you are mostly spot on, although I may have a different opinion on a couple of things you said. Overall my own experience and prayers attest to the same, but more importantly, so do Scripture and many writings of the Church Fathers and Doctors, documents of the great Councils, and writings of some of the true and Holy Popes and others, who have forseen and confirmed these things. We are surely in the end times, whether the final day will be tomorrow, next month, or in 50 or more years, we don’t know, but we must be prepared, and, as you so rightly say, Mary is our guide in the battle and our guide to Jesus Christ, Whom she first brought to us, by obedience to God, and to Whom she guides us, again in obedience. It’s just what she does. We must follow her lead, and the Rosary is not optional, as much as naysayers and modernists would like to insist. If Mary has told us to pray it daily, who are we to disobey the Mother of God? To obey Mary is to obey God. Devotion to Mary is devotion to God; to disregard Mary, to a significant degree, to disregard God. That all being said, without recourse to the Holy Mass in these end times, we have only recourse to Scripture, the living Magisterium, prayer, and Mary to keep directing us to God the Father, the Son, and the Holy Spirit. I would like to ask how you are practicing your Sunday obligation without recourse to the Mass. There are only false “masses” available where I live, as there really are no true and valid priests left, so I am reading the Propers and the Common of the Holy Mass (using the pre-1945 St.Andrews Missal) to the best of my abilities, but I am uncertain that I am properly obeying and honoring God on Sundays with this. Since we have no visible Church hierarchy anymore in this longstanding interregnum, we are more or less on our own, just doing our best to read the Mass and to try our best to make the Act of Contrition and Spiritual Communion. How, besides the daily Rosary (and when I say that, I mean the full 3 Mysteries, of course, “Mary’s Psalter”) prayer and reading of Holy Scripture and the writings of saints, etc, can we strengthen ourselves for the battle since we have no actual Sacraments? What do you do? I would love to talk with you further about these things. Can you please reply at your earliest convenience? Every thing you say is the truth. All Popes since vat 2 are anti popes. The Norvus Ordo is not Catholic but a man made Protestant religion. Only the Bishops and Priests ordained in the traditional Roman Rite of 2,000 years are true and genuine. I attend my local SSPX church where the Holy Latin Mass is said every day, 7 days a week. It nourishes my soul and we must keep on praying for our Holy Mother church, that she be saved from the intervention of Satan and modernism and freemasonary. Deo Gratias, Per omnia saecula saeculorem Amen. Sounds as if you’ll be told next that Mass is just a meal, and all this transubstansiation is all medieval hocus pocus! If I were you I’d find a more Traditional Church! I purchased a bunch and have been giving it to family and friends. Hi Dave, thanks for the tip, coupon code and answer to my prayer for which Rosary book to buy next. Thanks to your comment I bought one for each of my family members. You may be interested in a newly published, comprehensive book on the Holy Rosary entitled, “Champions of the Rosary”, by Fr. Donald Calloway. This book is fantastic, highly recommended, and in my humble opinion, a MUST-BUY if you’re interested in the Rosary of Our Blessed Virgin Mother in Heaven. The book is worth double or triple the price due to it’s extensive research, content and beautiful pictures of our Lady at the end of the book. P.S. Famous saints have been distracted (even falling asleep) while praying the rosary and they said don’t worry too much about it, just keep praying and bring your focus back to the rosary. The Blessed Mother asked us to pray the Rosary daily. ‘If we don’t get anything out of it…’. the priest said. The real question is what are we putting into it, what devotion do we have to praying the Holy Rosary? What is it that we expect to happen to us without our devotion to it and our Lady? The Blessed Virgin said that there are many graces we will receive from praying her Rosary, and if you do a search you will find what those graces and promises are she made to us. I would do the same thing you did (or thought about doing) Douglas: change confessors. Aww dear Douglas. The priest you mention must be a Norvus Ordo pastor who hasn’t been ordained in the Roman Rite. I only attend Holy Mass at my local SSPX church. The priests are ordained in the traditional Roman rite. I would never allow a Norvus Ordo pastor hear my confession or give me holy communion in the hand standing rather than reverently kneeling and without a paton placed under my chin to catch any falling particles of Christs substantiated body and blood within the consecrated host. Holy Communion in Novus ordo churches is the greatest sacrilege and just one of many liturgical abuses of the man made Novus ordo religion that reeks of Protestantism and dares to call itself Catholic. We must pray and say the Holy Rosary daily for the redemption of our once Holy Mother church. She must one day be triumphant like the Pheonix rising from the ashes. Hi Barbara, the rosaries themselves have not changed, only the way they are prayed. Any Rosary will do, preferably one that has been blessed though. 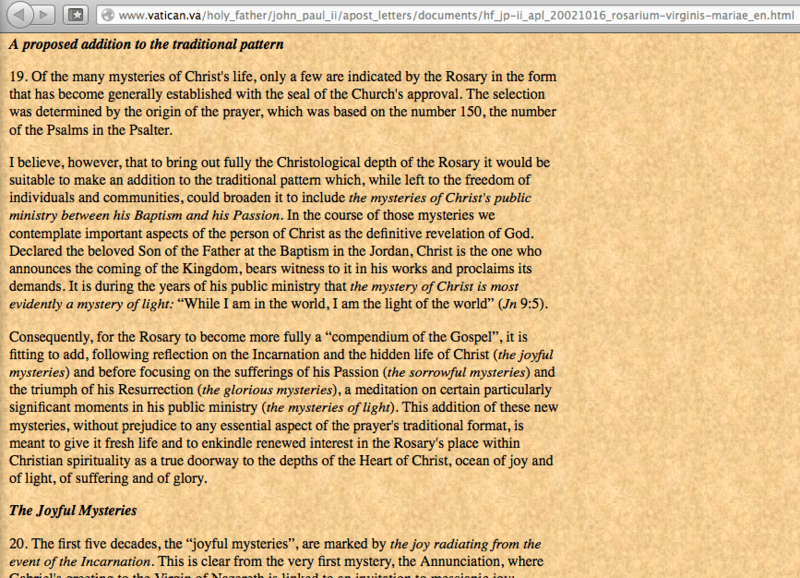 Hi Joao, thank you very much for your blog and Rosary PDF. I tried looking for the Rosary prayers and mysteries (without Luminous) the way that our Blessed Virgin Mary gave us, but couldn’t easily find it on the Vatican website. Your Rosary PDF is comprehensive and inspired, I truly enjoy it. By the way, my middle name is Joao. Thanks again and may God bless you. Hello Tito, I am pleased you found my blog… it literally is the ramblings of my mind 🙂 Here is a little interesting note, shortly after I created the PDF file from PowerPoint, I accidentally deleted the original copy. That means I have no real way of modifying the document, it is now set in virtual stone!
. how can I fine the original prayer guide now?the original rosary guide pls! tell were I can fine it. Are you related to the Machado family that is cousins with the Gracie family? Never heard of the Gracie family… What part of the world? I think Mike was referring to the Gracie and Machado Jiu Jitsu family from Brazil. Nice job on the pdf, exactly what I was looking for. I think im traditional and light mystries dont go well with me as an inclution to the traditional rosary. For me its a no no. Id rather just do the chaplet than do mystries of light. And what happened to the traditional rosary, its so hard to get it these days! The Rosary is most certainly a beautiful prayer, and it has become beautifully integrated in many customs of the Roman Church, but it is not a pillar of Catholicism. Eastern Churches (including Eastern Catholic Churches) have never upheld this practice (except through latinization), as the Rosary developed and spread after 1054 in Western Europe (after 1170 if you believe the pious story around St Dominic). In the Middle Ages, the Rosary was popularized in a context where most lay people could not read and thus could not pray the Hours. It was seen a good substitute to pray continuously. If one finds himself spiritually uplifted by praying the Rosary, with 15 or 20 mysteries, then blessed be God. But let us not pretend that one form or another are the traditional prayer of the Church. If you want to be traditional, then remember that the prayer of the Church has always been the Liturgy of the Hours — as it is called in the West. The Church had been praying it even before St Basil and St Jerome. If you don’t insist on being traditional, then please don’t take a superior tone to those who pray using 20 mysteries. If you follow, you will note that “traditionalists” vocal on this thread (SSPX, sedevacantists, etc.) are in fact very comfortable adopting new practices completely unknown to the first millenium of Christianity and presenting them as quintessential … so long as it hasn’t happened in the last century. Lastly, to suggest that the Our Father (the prayer taught by Christ as recorded in Holy Scripture) is equivalent to the Rosary (a pious custom dating back to the Middle Ages) is completely heterodox. It suggests a complete misunderstanding of what Revelation is, at taught by the Catholic Church. Likewise, to suggest that the reported words of the Mother of God to the children of Fatima somehow changes Revelation and Divine Law is preposterous. Remember, as Michael points out above, that the Rosary is a tool to unite with Christ … and if, rather, you get irritated by the Luminous Mysteries suggested by St John Paul II or bothered when some don’t add the Fatima prayer, then you are not using this tool properly. You are not Catholic… why are you posting here? I can read right through your post! Joao, you are mistaken. I am Catholic. Even if I were not, however, that would change nothing to the content I wrote above. I would be much more interested in reading a reasoned response to the points I raise rather than an attempt at discrediting my comments by pointing the finger at me. I am from the Ukrainian Greek-Catholic Church — a Byzantine Rite Eastern Catholic Church in full communion with the Holy See, and the second-largest particular church (sui juris) in the Catholic Church (after the Roman Church). If you are not willing to debate with me, you may choose to debate with the Catholic Encyclopedia — after all a good “Roman” source. No, you are not a Catholic of any Rite! I know what you are…. I will leave your comments up just so people can see how deceivers operate…. Joao, your words are offensive. You write again that I am not Catholic, which is, and was meant to be, insulting. Perhaps you deny that Eastern Catholics are “true” Catholics, or perhaps you are saying that I don’t truly belong to an Eastern Catholic Church. Either way, if this blog is meant for discussion rather than slander, I would ask that you explain what I have written that is wrong with justification from the Magisterium of the Church, rooted in Holy Scripture and Tradition, rather than attacking me personally. Even if you were convinced that my words were sinful, should you not practice love for the sinner and focus your anger at the sin? Twice now you have replied, saying nothing of the content, and hinting that you “know” who/what I am. No doubt, I am a sinner — but a Catholic sinner. Paradoxically, the prayer we Eastern Christians pray using prayer beads is the Jesus Prayer: Jesus, Son of God, have mercy on me, a sinner! Hi – I am also a Byzantine (Ruthenian) Catholic. I don’t want to get involved with your argument with Pascal. Just wanted to say I found some good information in your post about the traditional form of the Rosary. May I suggest you look into the Eastern prayer called the “Akathist to Mary”? I think those who love the Rosary and Our Blessed Lady will find it beautiful and inspiring as well. God bless!